May | 2015 | God Wins...but can I ? 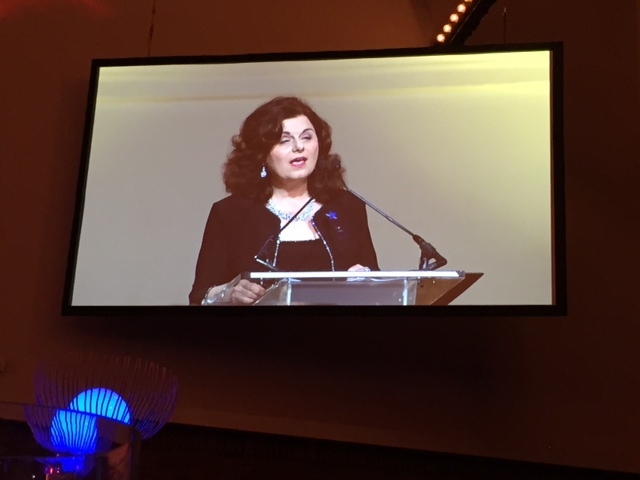 Saturday evening, I had the amazing privilege of sharing Leah’s story at the Wish Ball for the Make-A-Wish foundation. It was an honor. Spending the last month preparing for my 10 minute speech had me deeply thinking about our 14 month walk through the dark, cancer tunnel with Leah. The guest philanthropists were gracious and appreciative of hearing Leah’s story. It brought to life the need to help seriously ill children by granting them their wishes. I am so grateful that Leah lives on in our hearts and now also lives on in the hearts of 1000 people who attended the Wish Ball. How can I begin to even share how I did it? Truth is…I am compelled to tell Leah’s story. I love her deeply. Her life was beautiful and her passing is heartbreaking. Cancer wreaks havoc in all our lives: the person’s life, family members lives and community. The ripple affect is devastating. It’s a monster that ravages across the landscape of thousands of families. Children dying is tragically wrong – whether through illness, drunk drivers, abuse, suicide or accidents. Children dying makes it appear that evil wins. The expression fighting fire with fire means to fight one’s opponent by using a similar method as one’s attacker. We need to stomp out cancer and grind it to the dust. Does the fight against childhood illness need to be an aggressive, angry act, or can it be a gracious, good act? Can it be: sharing hope for a healthy future? Funding for a cure? Acts of kindness? Acts of giving? I do believe that by doing something good we are fighting fire with fire. For example, in the case of serious illness, a child’s emotional state is often depleted. It can be the support of others and beautiful organizations such as Make-A-Wish that keep children positive and give them energy to keep pressing forward. 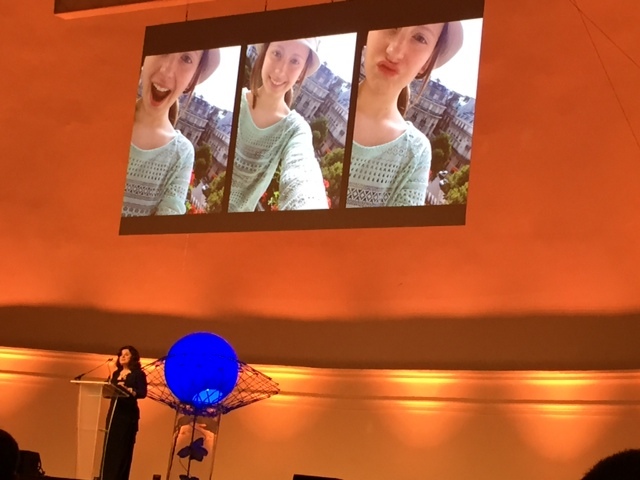 Our Wish trip to Paris totally energized Leah and helped her engage in life the days that we had her with us. Leah told one of her best friends that when she got well, she wanted to help kids with cancer. I am so proud of her. And I want to fulfill this wish of hers. Since high school, I have had a passion for excellence in communication. My major in college was speech and communications. All my career roles have focused on sharing and promoting thoughts and ideas. My desire is to take this learned ability and passion and use it for good to honor my daughter. I want to fight back with my words. There is a time to stand up and advocate for the voiceless. As Leah’s mom, I am making the deliberate choice to partner with God by bringing light into the darkness – speaking up to help other kids. At Wish Ball, I trust that sharing Leah’s story gained some ground in pressing back the darkness. I know that I can’t constantly stay in the fighting mode. There are days that I curl up in a ball and weep. My crying time tends to be when I am alone – in the shower. I also cry with other parents who have lost their children, and parents presently serving their children who have serious illnesses. There is a time to replenish and rest in the arms of the God of love. And I did this yesterday. You have wonderful talents and gifts. I encourage you to use your knowledge and skills to bring light to any darkness around you. Make-A-Wish fulfilled Leah’s full Paris wish. During our trip, we forgot to bring a lock for the Love Lock Bridge. She was so disappointed. 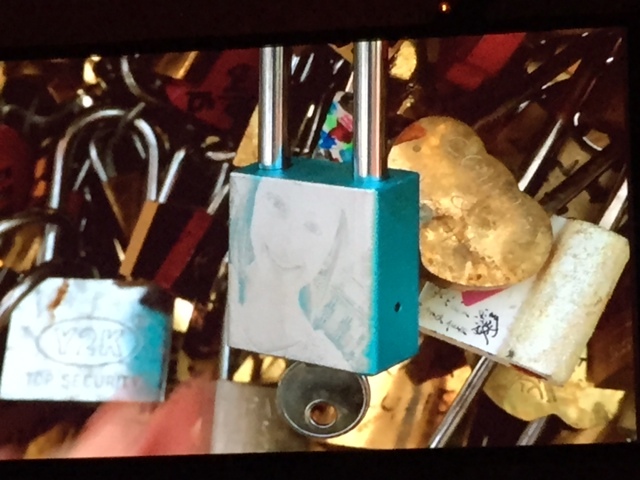 So, the Make-A-Wish staff sent a lock with her name and picture on it to Paris. She now has a lock on the famous bridge and we have an identical lock at home with us. Beautiful. I love Make-A-Wish. Are you a Strong Rock or Pliable Silly Putty? There are few things that we have in common. One is that we all have a mother. Someone who gave us life. Most times sacrificing her heart as a gift. As I approach my second Mother’s Day without Leah, I am reflecting on the ways that God has wired me as a mother for the well being of my children. One of the aspects of my grief in losing Leah, that I have avoided sharing, is the impact it had on me to walk alongside my suffering daughter. Leah did not complain, so I have avoided sharing details about the dark cancer tunnel. Because I want to honor her and imitate her lack of complaint. Yet, the reality is that the 14 months of her illness were long, stressful, depleting, unnerving and heartbreaking. No mother ever anticipates a terminal illness hurting her child or expects to outlive one of her children. I never did. I am now in community online and in person with parents who are or have walked their children through a similar season of illness. Since Mother’s Day is approaching, my focus is on moms. These women are my current heroes, whether they presently serve a seriously ill child or have walked a child to the gates of heaven. People often aren’t sure what to say to moms whose children are in a health crisis, so they use metaphors to help them communicate. Often people say we mothers are like rocks. In one regard, the rock metaphor is accurate because rocks are solid and strong. To walk your child through a terminal illness takes strength and firmness as we need to advocate for our child 24/7. This posture takes power. Yet, rocks are impenetrable. Rocks can be thrown. They can hurt and do damage. They are cold. They don’t adapt. They stay the same. I don’t think of myself as a rock. Other people say moms are more like eggs than rocks. I never realized this fact, but did you know that at a given angle, eggs can bear heavy weights? You can google You Tube videos and see eggs withstanding weights from dumbbells. I’m not scientific, but I understand it has to do with the shape and design of an egg. Its structure enables it to endure much pressure from top to bottom. That’s the reason some doorways are the shape of an egg – an arc. But if you put an egg on its side and hit it, it breaks open. I don’t think of myself as an egg most of the time either. There are two other objects that I prefer as metaphors. One object is a stress ball. Stress balls look hard on the outside, but when they are squeezed, they are soft and pliable. They adapt to the hand. They become form fitting. They are useful. Their purpose is to relieve pressure and stress. When held tightly, the stress ball loses its shape, but it achieves its purpose and it eventually goes back to its original shape. I hope that I absorbed a good portion of the pain and confusion that the cancer valley brought to our family and especially Leah. Although she didn’t share a lot of her thoughts, Leah knew that I was there to support and advocate for her. Cancer was the hand squeezing us; I was honored to absorb pressure for Leah. I prefer to think of myself as a stress ball. Another object is Silly Putty. Remember that rubbery stuff? I loved playing with it when I was a young girl. Silly putty is like clay. But unlike clay, I think it can stay soft for a long time inside its little plastic egg. 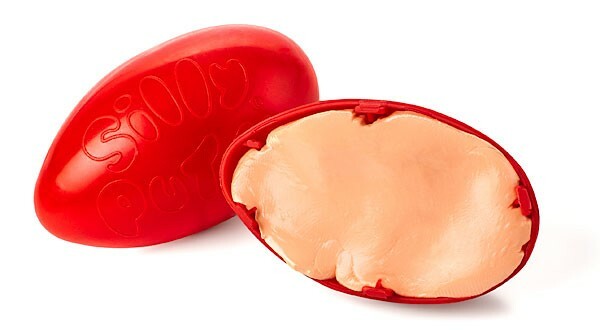 I remember thinking that Silly Putty could do anything. I could press it against newspaper and it copied the print. I could bounce it. I could shape it. I could streeeetch it. The cancer circumstance called for me to be moldable like Silly Putty. I had to learn to be: silent when I wanted to talk, act when I was frozen, patient when I wanted to scream and vocal when I wanted to blend in. I had to be a teachable student of my hurting daughter. I had to grow to form into an advocate and ambassador for her with the medical profession, friends and school community. Like Silly Putty, I had to find a place of protection so I wouldn’t dry out and be useless. For me the refuge was God and my strong community of friends. I also prefer to think of myself as Silly Putty. I think of moms everywhere dealing with hard circumstances – whether the challenge is a seriously ill child, loss of a child, or other painful life events. I admire you. You are worthy to be honored this week. We all face hardships. So do Dads. Brothers. Sisters. Aunts. Uncles. Friends. We are being formed through our unwanted trials. How do you see your response? Do you see yourself as a rock, egg, stress ball or silly putty? Or, do you have characteristics of all of them? Are you at peace with where you are at? If not, how do you grow to become more of who you want to be? Need to be?